This post examines La Leyenda Negra’s origins, its subsequent problems historically, and how echoes of the legend continue to implicitly resurface through the contemporary artistic practice of Teresa Margolles. The Black Legend isn’t just a banal Hispanophobic stereotype to be reduced to a sound-bite. If anything, the Black Legend is forgotten. The Mexican artist Teresa Margolles has been selected to aesthetically critique a view of marginalized people who are ignored by our misunderstandings, and our over-insistent categorizations. Hispanics in America are a people hated as much as their now undervalued past is forgotten. We consistently accept the ridiculous notion that the un-white person is not regarded as from here and that the white man is unquestionably American. In our overbearing bias we indirectly avoid seeing those people whom we’re ignoring. We will not comprehend all that we avoid when we are ignorant of our own blithe avoidance unless we examine own thinking as the problem to be challenged, again and again. “…the Black Legend had resulted in beliefs that Hispanics were inherently evil.” (Sanchez 1). The Black Legend is essentially a tired centuries-old Anglo/Protestant stereotype that cast the Spaniard’s as deceitful, sadistic, bigoted, dirty, bad-tempered, backwards, murderous, scoundrels, etc. La Leyenda Negra was already becoming a legend in the sixteenth century not long after Christopher Columbus (ca. 1451-1506) discovered America (better known then as the Indies). Friar Bartolomé de las Casas (1484-1566) who was personally acquainted with Columbus, and who was one of the original Spanish settlers in the New World, wrote an unsparing account of the abuses the Indians were subjected to under the rule of the Spanish. 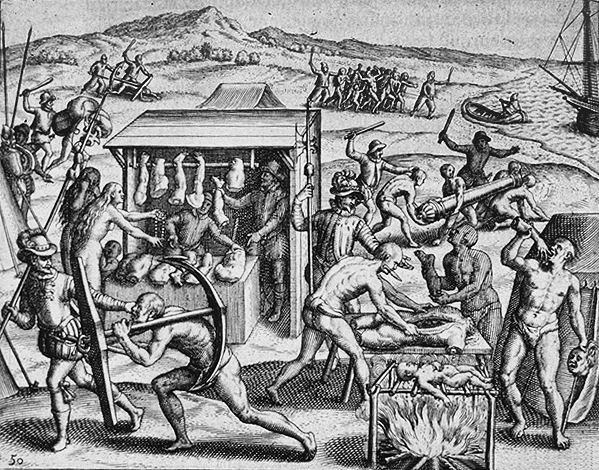 De las Casas’ “A Short Relation of the Destruction of the Indies – Brevísima Relación de la Destrucción de las Indias” solidified the claims of torture, exploitation, and the general depravity of the Spanish colonists, who already had been acquiring a bad name in Europe with their enforcement of the Spanish Inquisition (1480- ca. 1834). It’s worth noting that the “Black Legend,” in name, was not coined till the twentieth century. It was given this moniker by the Spanish journalist Julián Juderías y Loyot (1877-1918) in 1914, in his eponymously titled book that examined the Black Legend’s roots and its problems. De las Casas’ “Short Relation” wasn’t intended to despoil Spain’s reputation, nor was it ever meant to spread hatred and bigotry. The “Short Relation” was basically a report from the New World to the Spanish crown attesting to the maltreatment of the Indians. De las Casas was a tireless advocate of the Indians, so his explicit intent was to reform the existing “Encomienda” whereby the Spaniards were self obliged to not only take possession of any land in the New World, but the Encomienda enabled them to then possess the native peoples living on that land. The “Short Relation” is generous in the details of the torture and disrespect. De las Casas continues to call out the endless sadistic atrocities and indignation. His report worked, there were reforms, the Spanish crown worked hard to ameliorate their sins under the eyes of God. But, these efforts didn’t help to change what De las Casas had penned forth: a damning propagandistic report of the Spaniard’s supposed depravity in the New World. Despite of its extreme and obvious hyperbole, Spain’s European rivals ate it up. With its recent conquest of the New World, coupled with the Inquisition’s idealistic conflict with the Protestant Reformation—Spain had its jealous and non-catholic enemies in England, The Netherlands, France, etc. We need not be reminded that these foes had huge colonizing aspirations themselves, that were to eventually outmatch the Spanish, namely with the continued westward growth of the English colonies in America. As legends go there are truths to be found and hatreds to lose. We should never give in to the notion that the Spanish were any more barbarous then the rest of the New World colonists. In his outstanding book on the subject of the Black Legend, The Tree of Hate, Philip Wayne Powell speaks of many instances where the Black Legend is used against the Spanish with thinly disguised bigotry and hypocrisy. For instance, Powell writes of the ways the English easily forget their own glaring mistreatment of the American Indian, he writes, “…our English forbears treated Indians with a callousness and cruelty every bit the equal of Spanish behavior if not worse.”(16) Of course, none of this makes mention of the infamous ill treatment of African Americans under the care of the British and the other colony-hungry Europeans of the time. La Leyenda Negra enjoyed its popularity on through the nineteenth century, especially during the Texas Revolt (1836), Mexican-American War (1846-48), and the Spanish-American War (1898) (Sanchez 8). It is a sad irony that a Spaniard’s words (De las Casas’) would be translated and disseminated to fuel Hispanophobia, making the history of it all the more painful, especially with mindful consideration that his attempt was to help the plight of the mistreated Indians. Nowadays, the camouflaged bigotry rests not so much on illusions that Hispanics are deceitful, treacherous, sadistic, untrustworthy or other Black Legend lore. Today, Hispanics are hated because they’re viewed simply as (illegal) outsiders. Deeply embedded in this skewed viewpoint is another covert bias towards segments of the Hispanic population who happen to be poor and undereducated. It’s in these imperious oversights that countless people get blindsighted. It’s too simple to turn the other way when faced with those things that cause us pain; as it’s considered much easier to contemplate the so-called good life. Teresa Margolles – “What else could we talk about?” from Lesley Punton on Vimeo. It is in spite of all this delusion, that we turn to the contemporary art of Teresa Margolles (1963- ). Margolles’ artistic practice has to do with the contemplation of death, particularly violent Mexican death. Yes, Americans could stand to come to terms with Mexican death, including the mortal eventualities of their very own lives. Margolles helps us to see that even in death the poor are forgotten. Often, the bodies of those who have died violently disappear on the streets without a basic funeral, a memorial and without respect. Representing Mexico at the 2009 Venice Biennale, Margolles had a young man mopping a palazzo floor daily with mop water that had actual traces of blood and mud meticulously collected (by Margolles) from sites of Mexican narco-executions. The installation is titled “What else could we talk about?” In 2009 Kaelen Wilson-Goldies wrote an online piece for The National about this art work, “Margolles’ performances and installations call attention to a grim and seemingly untenable situation where demand for illicit substances meets an endless supply of violence.” In presenting an artwork where someone is mopping the floor with traces of the earth and of the corporeal body, Margolles’ art tarries with a handful of loaded metaphors. A man cleaning the floor, in itself, implies a janitorial duty that extends to a distorted American vision of Mexicans as belonging (only) to the working class. The so-called poor are not worth a second look in a scenario of exclusion. A similar prejudice affects the reality of death itself as we push its eventuality into the background far too often, mainly because it’s too damn uncomfortable to face. Yet, without a genuine recognition of death as an eventual fact, we fail to retain an authentic embrace of the inevitable. Not only is it vital to come to terms with our own mortality, but it’s also worth it to come to terms with the many who lose their lives in these marginalized conflicts, where human life is mistakenly disposed of much too casually. As much as we’re terrified to see death, we also are unable to witness the uncanny chaos of basic human suffering. De las Casas’ plaintive cry for the human rights of the Indians is brought to mind again (think of the spilt blood of the Indians). Bringing attention to those who cannot do it themselves always runs the risk of exaggeration, it can backfire, and it can easily be used against you, especially by those that detest you. But, how can we openly critique cultural bigotry, if not creatively? Little do we consider that in our striving to only pay attention to the pleasant, do we miss what’s most important—our essential humanity, our consideration for the plight others who we blindly deem as less fortunate. It is only with a wise and introspective critique of our own consistent, personal, and cultural tendencies to discard painful history for the sake of ease, can we honestly begin to regard ignorance for what it is. Surely ignorance has to do with ignoring and this problem isn’t unique to a specific culture or ethnic group. We are all guilty of broad oversights. A question remains as to how to learn from a habit to disregard the plight of others and in the same spirit teach ourselves how to recognize the value of all people, including those who do not look like us, those who do not think like us, or those who are not as privileged as us. In De las Casas’ humanitarian effort to save the unfortunate Indians of the New World, the Black Legend was born. Its ragged remnants drag on in the American half-life of forgotten of Hispanic value. Margolles’ shows us the blood of the nameless so that we can search our collective consciousness to remember our shared ability to empathize with others. La Leyenda Negra is forgotten just as America’s Hispanic has been erased. A memory of hatred has been replaced with a consistent inability to remember. De las Casas, Bartolome. A Short Relation of the Destruction of the Indies. London: Penguin Classics. 1992. Print. Powell, Philip Wayne. Tree of Hate. New York: Basic Books Inc. 1971. Print.